He went hard at Lorna Shore’s recent Philly gig. Lil Uzi Vert has never been shy about letting us know about his rock star credentials, even when he's the only one in the car. He's dropped 100 racks on a Marilyn Manson chain, and occasionally stresses out his more pious fans with his embrace of metal's satanic aesthetic. But it's not just for fashion: on Friday, Lil Uzi Vert and members of the production clique Working On Dying attended a show featuring metalcore band Lorna Shore at the Voltage Lounge in Philly. 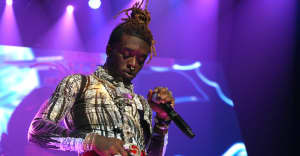 There are pictures of Uzi staring tenderly as the frontman screams into his mic, and videos of him getting deep into the mosh pit, and performing some seriously impressive high kicks. Check out footage and photos below. Lorna Shore snapped a photo backstage with Uzi, writing on Insta that "him and his squad went harder than anyone so far this tour." They also hinted at a "#collab" that's supposedly "#comingsoon." Even if that never manifests, there are still a lot of unreleased Lil Uzi snippets we're hoping to hear soon.